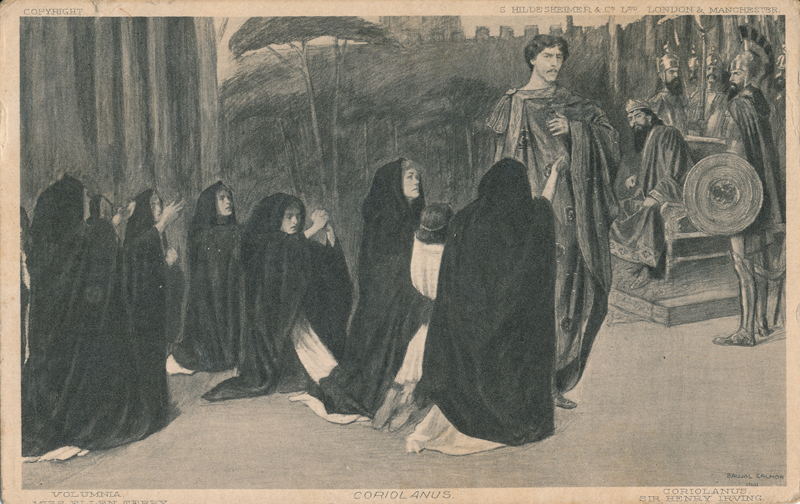 This image is a drawing depicting a group of people in dark robes kneeling before a man in a regal costume. There are soldiers behind him, to the right side of the image. As Coriolanus begins, two Roman patricians, Menenius and Martius, calm a revolt by the city’s famished plebians. Martius, who despises the plebians, announces that their petition to be represented by tribunes has been granted. When Volscian invaders attack Roman territories, Martius helps lead the Roman forces, and almost single-handedly conquers the Volscian city of Corioles, winning the name “Coriolanus.” The Volscian leader, Aufidius, swears revenge. Coriolanus and Aufidius join forces to conquer Rome. On the brink of success, Coriolanus is persuaded by his mother, Volumnia, to spare the city, though he knows it may cost him his life. Aufidius and his fellow conspirators plot Coriolanus’s death. Coriolanus returns to Corioles, where he is assassinated. Rome honors Volumnia for saving the city (reproduced with permission from Folger). 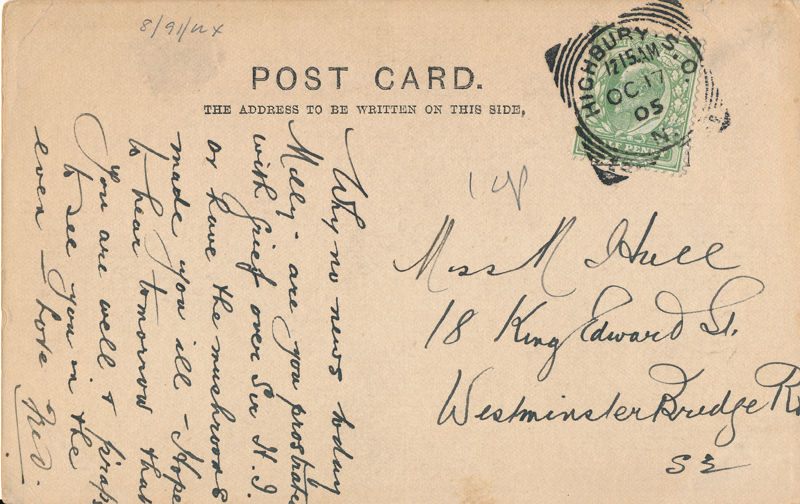 1910 Beginning on March 28, several companies presented a London Shakespeare Festival at His Majesty’s Theatre. Herbert Beerbohm Tree‘s company played The Merry Wives of Windsor, Julius Caesar, Twelfth Night, and Hamlet. Norman Mckinnel presented King Lear and The Merchant of Venice; Arthur Bourchier and his company came next with The Merchant of Venice. H. B. Irving played Hamlet, and Frank Benson‘s “Bensonians” followed with the Taming of the Shrew and Coriolanus. Poel’s Elizabethan Stage Society gave a performance—in the “original” sixteenth-century style—of The Two Gentlemen of Verona. Lewis Waller revived his Henry V, and Tree returned to close the Festival with The Merchant of Venice and Richard II (Loney, I: 54).